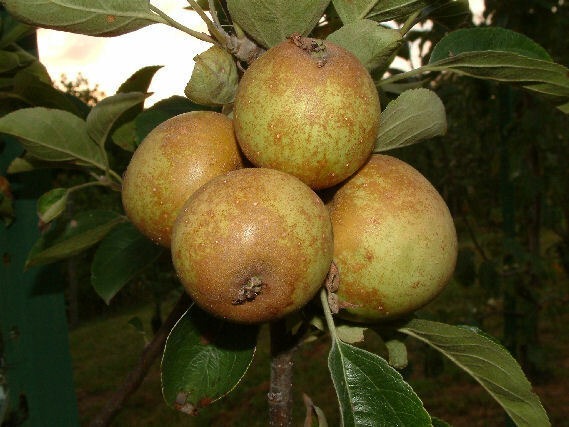 The name for this apple derives from the distinctive “brown eye” at the base of the apple. Brown Snout was discovered in 1850 on the farm of Mr. Dent of Yarkhill, Herefords in England. This cider apple produces a sweet, slightly astringent juice and makes a mild to medium bittersweet cider. A self fertile tree which is susceptible to fireblight. Fruit is small, greenish to greenish-yellow in color with patches of russet and a brown russet eye at the calyx end of the fruit. Ripens in October to November depending on location.